Long term effects of magic mushrooms. Using magic mushrooms on a regular basis can give you flashbacks. Flashbacks are hallucinations that can occur at random times for years after taking them last time you took magic mushrooms. These can occur at any time and at any frequency. They can be scary especially when the hallucinations hit you when you least expect them. a psychological dependence on hallucinogenic drugs. Using speed, ice or ecstasy when on magic mushies can cause panic attacks. It also increases the chance of having a bad trip. Taking some psychiatric medications with magic mushies will make your condition worse. This can be life threatening. 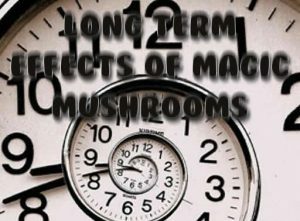 Do not take magic mushrooms if you are on these types of medications. Check if you are not sure. Some people start chain-smoking while tripping on magic mushrooms. This is very hard on your body and your heart. If you’re going to use recreational mushrooms, try to never mix them with cigarretes, alcohol or other drugs. It’s not necessary and can ruin and otherwise good trip. Please remember to keep hydrated as you may find yourself with loads of extra energy that you’ll be burning up doing activities. The biggest risk taking magic mushrooms is not identifying the correct ones. Some look like deadly poisonous species. Do not ever ingest anything if you are in doubt. Always check. If someone collapses after taking what they think are magic mushrooms, call 000 for emergency help straight away. And, if you think you or others have taken poisonous mushrooms do not wait for the symptoms to start, call 000 for help immediately.